LepraCON is Back! 2 Days + 15 Bars + $3 Drinks + Over 3000 Pub Crawlers at the Best St. Patrick’s Day Event in San Francisco! 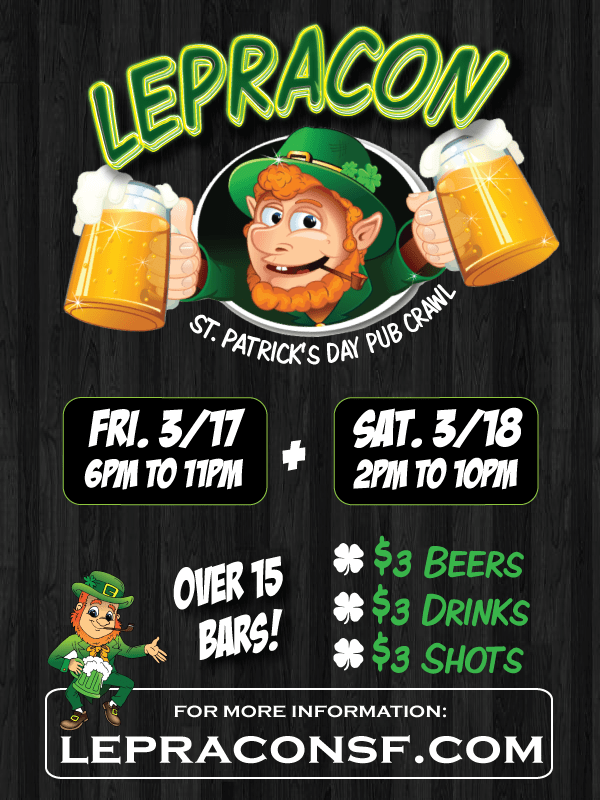 St. Patrick’s Day is one of the best drinking holidays of the year and the perfect opportunity to celebrate with a MASSIVE PUB CRAWL! CrawlSF has put together some killer drink specials and put together a huge list of bars (No Cover!) where you can enjoy all the green beer, cocktails and shots that you can drink (please drink responsibly). Over 2000 people took over Polk Street last year for the biggest St. Patrick’s Day Pub Crawl in San Francisco. This year’s event will be even bigger and better with some special surprises, additional bars and more! For 2017, there will be 2 PUB CRAWLS!. The first one will be on Friday, March 17 and the second will be on Saturday, March 18. Tickets include access to $3 Beers, $3 Cocktails, $3 Shots at over 15 bars, NO COVER, DJs, Dancing , Afterparties and some sweet surprises and giveaways. Grab your tickets early and save money (the prices will rise closer to the event date). Drink Specials: $3 Beers, $3 Cocktails, $3 Shots and more. You can check it at either location. MAYES – MCTEAGUES – LUSH LOUNGE – BLUR – VERTIGO – PLAYLAND – SODA POPINSKI’S – CABIN – WRECK ROOM – R BAR – SHANGHAI KELLY’S – ROUGE – BULLITT – TONIC – ROYAL OAK – HOUSE RULES – BRICKYARD – BAR NONE – BLUE LIGHT and more! AFTERPARTIES WILL BE ANNOUNCED SOON!